Written with humor and personality, this debut memoir recounts a woman’s spiritual quest of experiencing thirty religions before her thirtieth birthday. Post-Traumatic Church Syndrome is for questioners, doubters, misfits, and seekers of all faiths, and tackles the universal struggle to heal what life has broken. On her twenty-ninth birthday, while guests were arriving downstairs, Reba Riley was supposedly upstairs getting dressed. In actuality, she was slumped on the floor sobbing about everything from the meaning of life to the pile of dirty laundry on the floor. In a debut memoir that is funny and earnest, Riley invites questioners, doubters, misfits, and curious believers to participate in the universal search to heal what life has broken. Post-Traumatic Church Syndrome takes you by the hand and reminds you that sometimes you first have to be lost in order to be found. Reba Riley is an author, speaker, former Evangelical Poster Child, and lover of all things sparkly. She lives in Cincinnati, Ohio, where she plans to write more books...once she recovers from Post-Traumatic Memoir Syndrome. She blogs about spiritual health and healing for Patheos.com. "Hilarious, courageous, provocative, profound ... Reba Riley brings the light for seekers of all paths, reminding us that every journey of transformation begins exactly where we are. If the 'Pray' in Eat, Pray, Love had a gutsy, wise, funny little sister who'd never been to India, it would be Post-Traumatic Church Syndrome." "Whatever your beliefs or lack thereof, whether you pay heed to a savior or a spirit animal, you should read this moving, funny, thoughtful book. Reba Riley has traveled the unlikely mystic's path and come back with an enormously entertaining, immensely hopeful report." "PTCS is a brilliant, emotional and audacious rampage through religious sensibility, an exploration I recommend without hesitation. Enjoy!" "Riley's debut gently offers...a powerful love that is greater than any single religious expression." "Reba Riley is a natural-born storyteller and writer who I expect to be reading for many years to come." 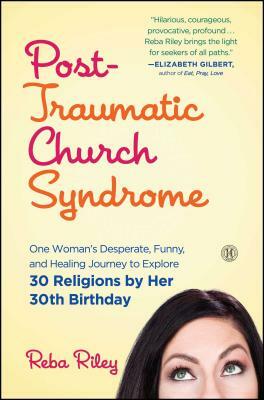 "Post-Traumatic Church Syndrome is real. Been there done that. If you have been there too, this book is going to let you know you are not alone. Prepare to be encouraged to leave outright abuse of spiritual power and dogma of the kind that kills the soul. Prepare to survive. Courageous and wonderful, Reba Riley to the rescue!" "Moments of laughing and tears. It provided much needed closure for me in many ways. I love Reba Riley and her heart and work. I'm honored to be her teacher and also, through her book, her student. (Deep bow of respect.) Namaste." "Honest, witty, and reflective... Reba is real when it comes to 'religion' and what it takes to unpack that word in our culture today. This is a book for anyone who has fumbled, wondered, fallen away, or wanted something bigger to hold them close at night. She doesn't claim to have all the answers, but Reba, undoubtedly, is asking all the right questions." "Whether you're spiritual, religious, or neither, Reba Riley's grace, wit, charm, and profound insight will make you laugh and think. She is an author to watch!" "In this humorous, self-deprecating memoir, Riley turns pain and suffering into an (almost) fun journey of self-discovery and personal enlightenment."